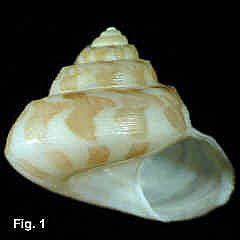 Description: Shell width greater than height. Whorls strongly shouldered at upper fifth; shelf above flat or concave, sometimes with axial folds; whorls rounded below. Sculptured with microscopic spiral riblets; on penultimate whorl, shelf smooth, or with 3-8 riblets, whorl below shoulder with 10-30 riblets. Axial sculpture absent below whorl angulation. 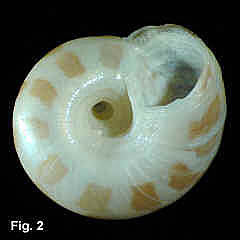 Base rounded, sculptured similarly to spire. Umbilicus widely open, extending to apex, sometimes bordered with a weakly beaded rib; one or two spiral ribs within umbilicus. Aperture circular; outer lip smooth within. Colour white with axial red-brown streaks, present on base as about 10 irregular patches. Interior nacreous. Size: Up to 8 mm high, 9 mm wide. Distribution: Endemic to Australia; Fraser Is, Qld, to Cape Wiles, SA, including Tas. Habitat: Taken in 15-399 m. Common. Comparison: Distinguished within the genera Minolia and Spectamen by the very fine spiral sculpture, and by the colouration. Synonym: Spectamen epitheca Iredale, 1929 is based on an unusually strongly ribbed specimen.